Here are some different products that we offer. Our main product here is out Care Kleen Colon and Intestinal Cleanse System. We recommend that you do the full 3 month system but we offer it is 1 month sizes if you prefer. We also offer a Herbal Energy Pill that is one of the best that you will find. 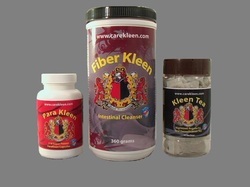 CareKleen Cleanse is a 3 Stage System that is formulated for a 3 month program.